The U.S. Department of Energy's (DOE) National Energy Research Scientific Computing (NERSC) Center and Cray Inc. announced today that they have finalized a new contract for a Cray XC40 supercomputer that will be the first NERSC system installed in the newly built Computational Research and Theory facility at Lawrence Berkeley National Laboratory. This supercomputer will be used as Phase 1 of NERSC's next-generation system named "Cori" in honor of bio-chemist and Nobel Laureate Gerty Cori. Expected to be delivered this summer, the Cray XC40 supercomputer will feature the Intel Haswell processor. The second phase, the previously announced Cori system, will be delivered in mid-2016 and will feature the next-generation Intel Xeon Phi processor "Knights Landing," a self-hosted, manycore processor with on-package high bandwidth memory that offers more than 3 teraflop/s of double-precision peak performance per single socket node. NERSC serves as the primary high performance computing facility for the Department of Energy's Office of Science, supporting some 6,000 scientists annually on more than 700 projects. This latest contract represents the Office of Science's ongoing commitment to supporting computing to address challenges such as developing new energy sources, improving energy efficiency, understanding climate change and analyzing massive data sets from observations and experimental facilities around the world. "This is an exciting year for NERSC and for NERSC users," said Sudip Dosanjh, director of NERSC. "We are unveiling a brand new, state-of-the-art computing center and our next-generation supercomputer, designed to help our users begin the transition to exascale computing. Cori will allow our users to take their science to a level beyond what our current systems can do." "NERSC and Cray share a common vision around the convergence of supercomputing and big data, and Cori will embody that overarching technical direction with a number of unique, new technologies," said Peter Ungaro, president and CEO of Cray. "We are honored that the first supercomputer in NERSC's new center will be our flagship Cray XC40 system, and we are also proud to be continuing and expanding our longstanding partnership with NERSC and the U.S. Department of Energy as we chart our course to exascale computing." A key goal of the Cori Phase 1 system is to support the increasingly data-intensive computing needs of NERSC users. Toward this end, Phase 1 of Cori will feature more than 1,400 Intel Haswell compute nodes, each with 128 gigabytes of memory per node. The system will provide about the same sustained application performance as NERSC's Hopper system, which will be retired later this year. The Cori interconnect will have a dragonfly topology based on the Aries interconnect, identical to NERSC's Edison system. In addition, NERSC is collaborating with Cray on two ongoing R&D efforts to maximize Cori's data potential by enabling higher bandwidth transfers in and out of the compute node, high-transaction rate data base access, and Linux container virtualization functionality on Cray compute nodes to allow custom software stack deployment. "The goal is to give users as familiar a system as possible, while also allowing them the flexibility to explore new workflows and paths to computation," said Jay Srinivasan, the Computational Systems Group lead. "The Phase 1 system is designed to enable users to start running their workload on Cori immediately, while giving data-intensive workloads from other NERSC systems the ability to run on a Cray platform." As previously announced, Phase 2 of Cori will be delivered in mid-2016 and will be combined with Phase 1 on the same high speed network, providing a unique resource. When fully deployed, Cori will contain more than 9,300 Knights Landing compute nodes and more than 1,900 Haswell nodes, along with the file system and a 2X increase in the applications I/O acceleration. "In the scientific computing community, the line between large scale data analysis and simulation and modeling is really very blurred," said Katie Antypas, head of NERSC's Scientific Computing and Data Services Department. "The combined Cori system is the first system to be specifically designed to handle the full spectrum of computational needs of DOE researchers, as well as emerging needs in which data- and compute-intensive work are part of a single workflow. For example, a scientist will be able to run a simulation on the highly parallel Knights Landing nodes while simultaneously performing data analysis using the Burst Buffer on the Haswell nodes. This is a model that we expect to be important on exascale-era machines." 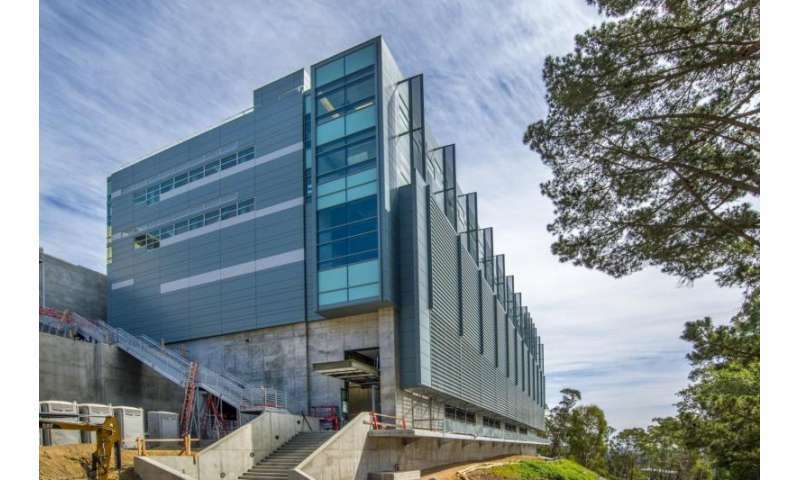 Berkeley Lab's new Computational Research and Theory facility looks like an old Hollerith card sorter, writ large!